John Fortune joined the Leicester Mercury as a junior reporter in 1929 and remained with the paper through to his war service, when – as a keen yachtsman – he was quickly commissioned in the Air-Sea Rescue Branch of the Royal Air Force. He commanded operational units in England, Scotland, at the D-Day Landings and in the South-East Asia Command, from where he was invalided home just before the end of World War II. 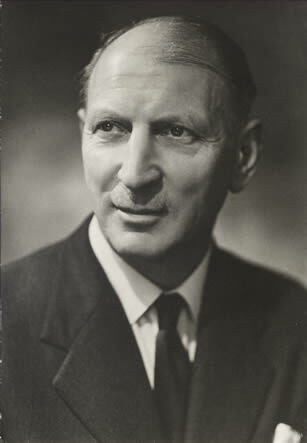 After his war service he returned to the Leicester Mercury as Picture Editor, and after a sort time as Editor of its sister paper, the Illustrated Leicester Chronicle in 1948 he was appointed Editor of the Leicester Mercury, joining the Board of Directors the following year. He served as very successful campaigning Editor, and also a frequent writer on the paper, for over 22 years, seeing the daily circulation rise from 50,000 to 185,000. In due course he added to the editorship with the posts of Managing Director and Chairman. After seeing the paper through to its centenary in 1974 he retired, though he remained on the Board as a Non-Executive Director through to 1982. In addition to his membership of the Lit and Phil, which he joined in 1958, he was very active in many other organisations and areas of local life, including the Leicestershire Club, the Leicestershire Golf Club, and the University of Leicester’s Haldane Society. In his retirement he moved to Scotland, and died in Greenock, near Glasgow, in December 1989. Presidential Address: 5th October 1970: Address by the President [on Heinrich Schliemann and Arthur Evans, the discoverers of Troy, Mycene, and the Palace of Knossos]. Abstract only published: Transactions of Leicester Lit and Phil vol. 65 (1971), p. 5.